These interactions provide ATLAS with the means to study quantum electrodynamic (QED) processes, such as dilepton production and light-by-light scattering (first seen by ATLAS in 2017), and quantum chromodynamics (QCD), via the study of the quark-gluon substructure of nuclei. However, it remained an open question whether dileptons from photon-photon interactions could be observed in more typical high-multiplicity interactions of heavy ions and, if so, whether they would be sensitive to the dramatically increased charge density inside the QGP. To study dimuons in lead-lead collision data, ATLAS analysed two variables characterizing the kinematic properties of the two oppositely-charged muons, namely “acoplanarity” and “momentum asymmetry”. The “acoplanarity” variable measures how much the two muons are not back-to-back. The “momentum asymmetry” variable reflects the relative difference in the transverse momenta of the muons, or the momentum that is perpendicular to the beam line. Both quantities are large for muons decaying from heavy flavor mesons, while both are nearly zero for the gamma-gamma process. 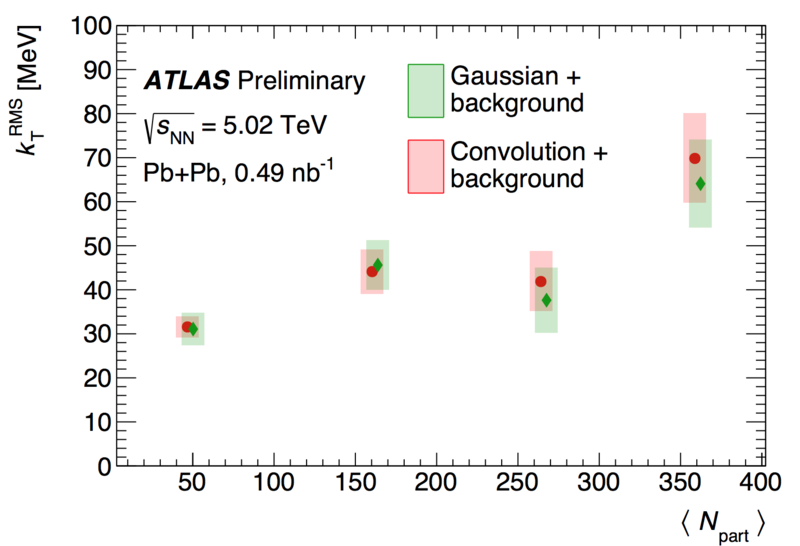 As heavy flavor mesons have a long lifetime, they travel an appreciable distance before decaying and so can be measured precisely by the ATLAS pixel detector as the distance where the track is closest to where the event occurred. Using this distance, the fraction of heavy flavor decays can be estimated, and allowing the most important background to be subtracted from measured distributions of the acoplanarity and the momentum asymmetry. The corrected acoplanarity distributions are shown in Figure 1. The rightmost panel shows two distributions. One is the acoplanarity distribution for the approximately 20% of events with the lowest amount of transverse energy in the ATLAS forward calorimeter. These events are primarily “ultraperipheral” and reflect isolated gamma-gamma interactions, and are used as a reference for the other measured events. The other distribution (“40-80%”) represent pairs from 40% of events with higher transverse energy, which is understood to arise from having a greater overlap between the colliding lead nuclei. One can already see that the measured acoplanarity distribution is somewhat wider. Over the next three panels, moving to the right, the distributions get progressively wider, with the 10% most “central” events being more than twice as wide as the reference distribution. Given that the two muons started out nearly back-to-back, what could have caused this change in their relative angles as the two lead ions overlapped more and more? One plausible scenario is that one of the muons passed through the quark-gluon plasma, which has a high density of charged quarks and anti-quarks. This could have caused the muon to scatter off of at least one of the quarks, changing the muon’s angle slightly. To compare the data with models of such scenarios, the width of the acoplanarity distribution is converted to a characteristic transverse momentum imparted to each of the muons, relative to its original direction. This is shown in Figure 2 as a function of the number of participating nucleons, which increases with forward transverse energy. It shows that central events impart an extra 70 MeV relative to what is observed for muons in ultraperipheral collisions. This offers the intriguing possibility that muon pairs from gamma-gamma interactions can be used to study the charge density of the quark-gluon plasma produced in central heavy ion collisions.